IBM® i2® Integrated Law Enforcement is an IBM Smarter Cities® solution that addresses the needs of modern-day law enforcement agencies. It is a solution framework that provides the individual capabilities of the products that comprise the solution and extended capabilities developed through the synergistic integration of those product components. As a framework, IBM i2 Integrated Law Enforcement allows for the continuous expansion of capabilities by putting together building blocks within the system and integrating with new, external systems. In doing so, an organization can respond and adapt to its changing needs. 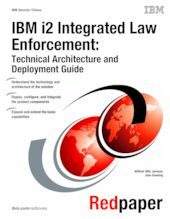 Simply stated, the configuration, integration, and implementation of IBM i2 Integrated Law Enforcement and its components provide the tools for more effective law enforcement. This IBM Redpaper™ publication explains the technology and the architecture on which the solution is built. Most importantly, this paper enables technical teams to install, configure, and deploy an instance of the i2 Integrated Law Enforcement solution using the product i2 Intelligent Law Enforcement V1.0.1. This paper is targeted to solution architects, system and deployment engineers, security specialists, data management experts, system analysts, software developers and test engineers, and system administrators. Readers of this paper will benefit from the IBM Redguide™ publication "Integrated Law Enforcement: A Holistic Approach to Solving Crime", REDP-5116.